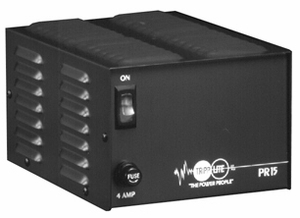 Precision-regulated economy DC power supplies efficiently convert 120 VAC to 13.8 VDC. Crowbar over voltage protection prevents damage to connected equipment (15 amp and larger models). Solid state, integrated circuitry provides excellent regulation of output voltage.